Our propane delivery service areas include but aren’t limited to the following areas: Baldwin County, Wilkinson County, Lake Oconee, Lake Sinclair, Jones County, Hancock County, Greene County, Putnam County, and Washington County. Don’t worry about keeping a watch on your propane tank’s gauge! G & S will monitor your tank’s gauge and based on the size of your tank and your average usage, your tank will be automatically filled when it starts to run low. If you prefer, you can monitor your propane tank’s level and call us to schedule your propane delivery when it’s convenient for you. 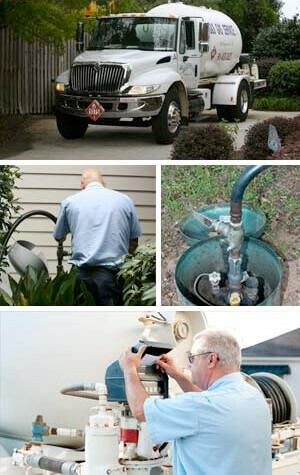 Click here to request a propane delivery / refill! G & S Gas has an onsite­bottle plant available to refill any size cylinder or RV while you wait.